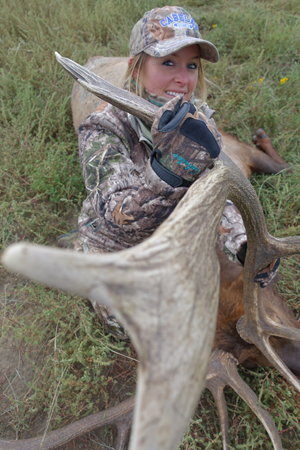 Magpul Core is all about getting unconventional, which as a hunter, is great practice. Learning how to build a shooting position in unconventional ways increases success afield. In order to be the best, you have to train with the best—and Magpul Core offers some of the most comprehensive long- range precision rifle instruction (LRPR) available to civilians in the country. In fact, I am such a fan of the Magpul Core curriculum that this was my third time attending the LRPR course. Why keep coming back? Because the fundamentals of marksmanship are a perishable skillset, and Caylen Wojcik, director of training of Precision Rifle Operations for Magpul Core, has served 8 years as a Marine Scout Sniper, executing more than 100 combat missions and giving civilians an opportunity to train with one of the most respected snipers in the country. North American Hunter- So You Wanna Shoot Far? Long-range shooting and precision marksmanship require all of the components of your shooting system—including your rifle, riflescope, ammo and shooter—to be reliable, consistent and repeatable. In the field, when Mother Nature is calling the shots, successfully taking advantage of that opportunity of a lifetime comes down to preparation and training. When the animal of my dreams steps out and provides that opportunity that I have been waiting for, I want to be certain that I have done everything possible to make that one shot count. 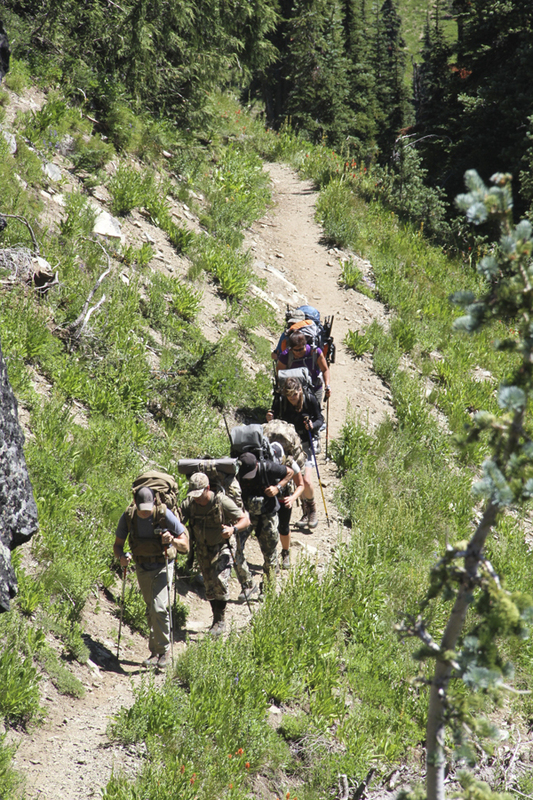 Magpul Dynamics has teamed up with Guiderite Adventures to create the ultimate instructional program specifically designed with the hunter in mind that has the desire to take on do it yourself, back country backpack hunting adventures. Having trained with Magpul Dynamics for three consecutive years in a row, I can personally attest to Caylen Wojcik being a top notch firearms instructor combined with Luke Carrick from Guiderite’s backcountry hunting expertise, attending this course was a no brainer and I couldn’t get signed up fast enough. The course is set up for five days of comprehensive instruction and provides the opportunity for experienced and inexperienced backcountry hunters alike to understand equipment capabilities and limitations as well as teach students how to maximize the effectiveness of their hunting rifle while training under real hunting conditions, shooting realistic angles and pushing both your mind and body through some of the same rigors that one can expect during a backcountry hunt. No matter how long you have been hunting or shooting, there are new skills that you will learn and develop during this course. The five day course begins with two days of instruction on the range providing students an opportunity to familiarize themselves with their own personal hunting rifle, its capabilities and limitations as well as providing the opportunity to learn or practice the fundamentals of marksmanship. The most basic but critical components of our individual firearms are discussed at this time; everything from correct rifle fit, scope mounting, ammunition selection, rifle slings, the use of bipods, and on to the basic fundamentals of marksmanship. Caylen takes a tremendous amount of time discussing the fundamentals while providing a controlled environment for students to practice and develop those fundamentals in as realistic hunting conditions as possible while on the range. This practice is designed to extend each students comfort zone in the field creating responsible, ethical shots during the hunt. The basics in angular units of measure, both milliradian and minutes of angle are taught. Everyone then learns which unit measure their particular optic is and how to understand the function of the scope from turrets to reticle. Mother Nature is anything but predictable, so Caylen teaches how environmental conditions affect bullet trajectory. As a hunter, it is critical to know where your rifle zero is and where your max point blank or terminal range is based off of that zero. Students are also taught how to use personal ballistics software to define where the max point blank is for your individual firearm. No two hunting situations are the same and we as hunters must learn to be adaptable making the most of each opportunity. Rarely one has the opportunity for a prone rest, so we practiced numerous resting positions, and proper rest building techniques. 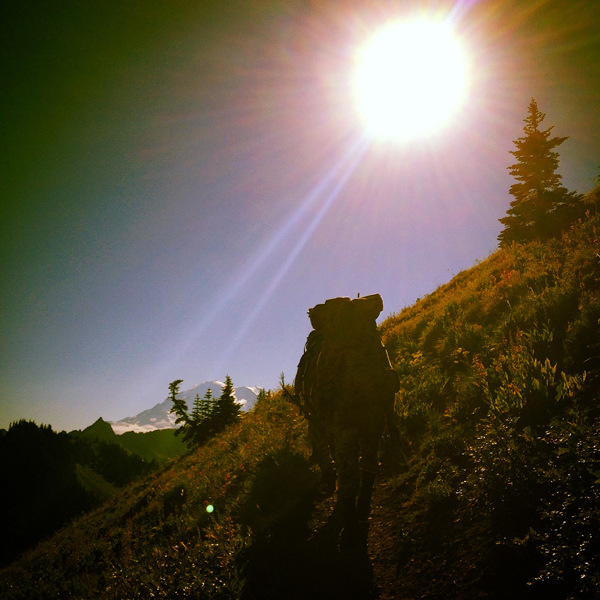 After spending two days behind the gun on the range, everyone was anxious to begin our three day, two night trek into the Cascade Mountains of Washington. The great thing about backpacking is that there is tons of gear readily available on the market today. The bad thing is that for the novice backpack hunter, selecting the best most functional and versatile gear for your trek is not always easy. Having nearly two decades of experience backcountry hunting, prior to beginning our trek, Luke Carrick, Owner/Operator of Guiderite, provided students with a comprehensive breakdown of each component of our necessary gear from pack selection, fit, loading and wear, firearm carriage, nutrition and hydration, tent selection based on seasonal use, sleeping bag selection based on seasonal use and fill component, sleeping pad selection, water purification options and meal planning. With a more comprehensive understanding of what primary and necessary functions that each piece of equipment needs to facilitate while in the backcountry, students were then able to evaluate and discuss personal equipment and borrow necessary equipment for the trek if needed. Once our own personal gear for the backcountry portion was organized and properly loaded into our packs, we were ready to begin our adventure. The day was warm, sun high in the sky as we began our trek climbing the mountain. Destination, adventure. New school meet old school. Technological advances have come a long way and I am guilty of being completely reliant upon my GPS unit for the basics of land navigation. 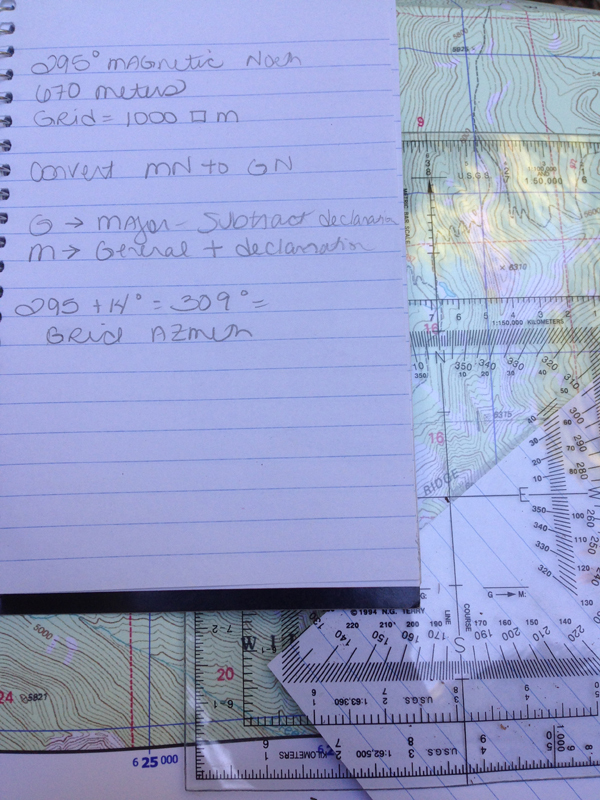 As I learned in the backcountry portion of the class, an old school map and compass for land navigation, offers a lot of tools that are both necessary and helpful during the hunt. Stopping along the trail, students were taught the beginnings of basic land navigation and compass use, everything from how to read a detailed topography map, attain and track current location on a map, and tips for easily and quickly noting general direction of travel. We were even taught how to create a solar compass. After a long day’s hike in some of the most spectacular scenery in the world, it was time to set up camp. Luke walked students through the process of proper camp site selection for hunting scenarios and fire starting techniques. The evening was spent on the mountain, behind our optics practicing newly learned observation skills with the hopes of identifying wildlife just like in a real hunting or scouting scenario. 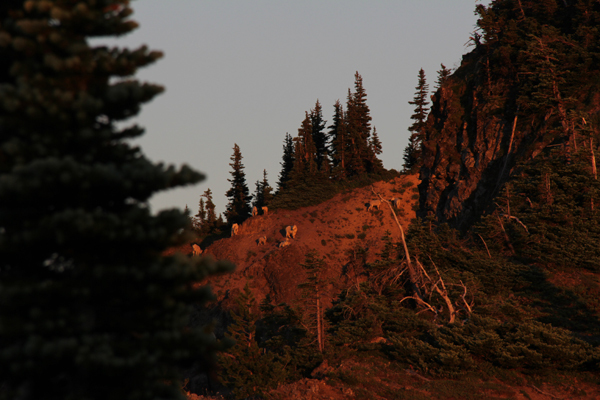 The next morning, the mountain goats, elk and mule deer were all on the move from their feeding to bedding areas. 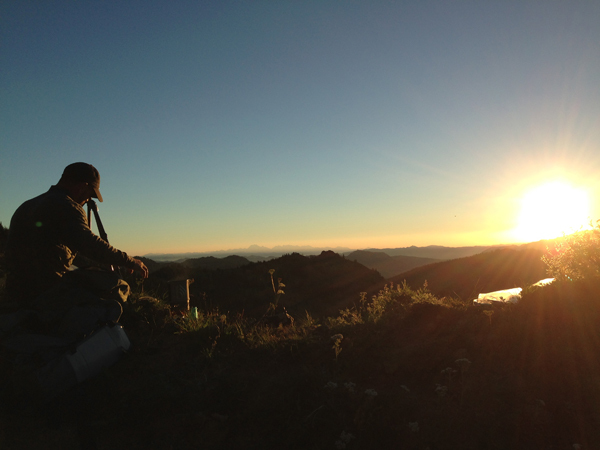 Sitting on the side of the mountains with my binoculars in hand, I took delight in watching the sun began to peek over the landscapes lighting up the valley below. A new day had just began and the excitement for the days happenings were already stirring inside me. After packing up our camp and grabbing water, Luke taught us a new tip for hiking in steep terrain with a heavy load without stopping for breaks called the resting step. Using this method, our entire class hiked over one hour straight up a mountainside without a single break. As a mountaineer, this is arguably one of the most valuable techniques I have ever employed. As a hunter, this is going to help me pack out trophies for the remainder of my life. Sitting on a rock cliff, behind the gun, three targets stretched out below me, in this first course of fire, I had five minutes to employ my newly learned observation skills and fundamentals learned on the range to identify the three hidden steel targets, range estimate them, make necessary dope adjustment and engage them with a two shot per target ammunition allowance. The thrill of the hunt was on. Searching for targets in dark hidden folds of shadows and terrain features, just as if you were searching for that bedded trophy of a lifetime. This was the live fire, real life in-field shooting that I had been looking forward to. Three courses later, I had successfully located, range estimated and calculated dope for every target, in every scenario within the time limit and with first round hits. 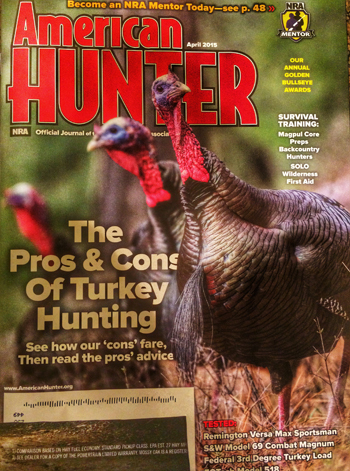 The backcountry hunters course would not be complete without pre-season scouting tips and tactics. Part of success as a hunter is monitoring the game we seek and during our trek down the mountain, we checked the trail cameras that had been placed a couple of weeks before giving us all an opportunity to evaluate the area wildlife which included, a wolf. This incredible experience will make any hunter, novice or experienced, a more confident capable shooter that is better equipped with knowledge and tools to embark upon the most epic of hunting adventures, backcountry backpack hunts. 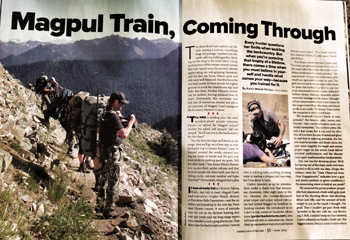 Click here to learn more about Magpul Dynamics Backcountry Hunters Course.